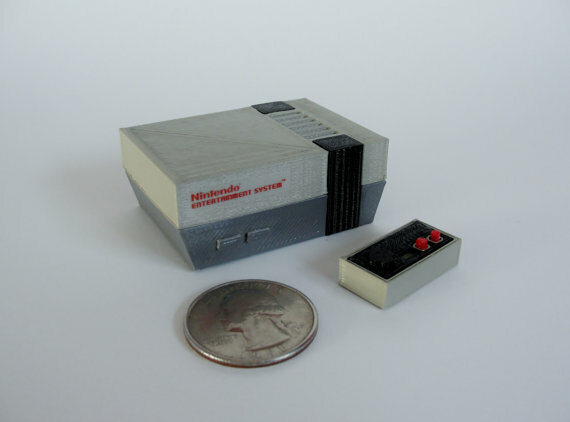 Using the programming-oriented 3D-Compiling software OpenSCAD, Dave has designed many 3D Printed Mini Consoles, ranging from current systems like the Xbox One to Retro Systems such as the Apple Mac Mini, Sony Playstation, Commodore 64, and even an NES design that was randomly given away at Seattle Retro Gaming Expo, to name a few. Each of these models were carefully designed into sections to be assembled subsequent of printing all the parts, sectioned by color for ease of printing in different color filaments or spray painting if you plan to paint the models instead. Small details are accounted for as well with controller designs, games, decal stickers, and even software graphics to print and adhere inside computer monitor screen bezels. 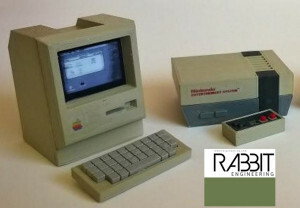 Those who do not have access to a 3D Printer even can purchase existing printed models and custom designs from the Rabbit Engineering Etsy Store. Along with Mini Consoles, Computers, and Arcades, Dave has created many electronic projects like the Multijoy Retro Joystick Hub, the NESPoise NES Desktop Arcade, and the NESPo Nintendo-on-a-Chip portable.You can find his more of his work on the Rabbit Engineering blog website, Thingiverse, a Facebook Community Group and on Twitter @rabbitengr.